One thing about bird feeders is that you can always count on something to photograph. You can also always count on certain birds to make an appearance. 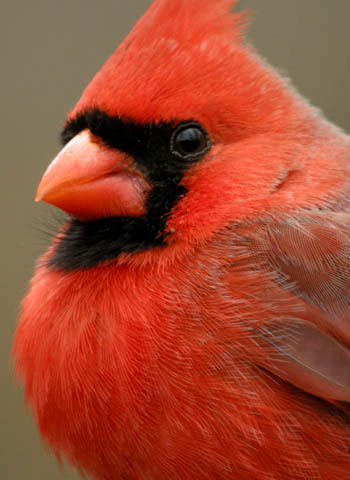 One of my all time favorites is the Northern Cardinal which I always loved as a child and love even more after being cardinal-deprived while I lived in Colorado. I miss the Golden Eagles and magpies of the West but there is some compensation when that bright red snatches my attention amidst the grays and browns of a winter forest. 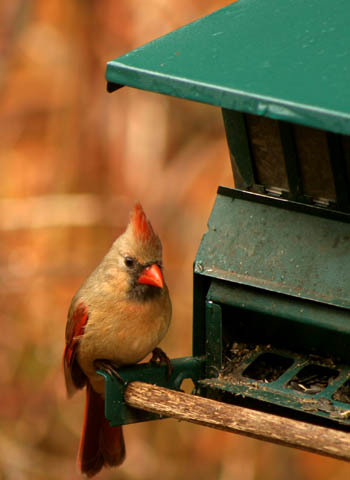 Peace Valley Natural Area, which is just northwest of Doylestown, has a nice feeder station behind the nature center. 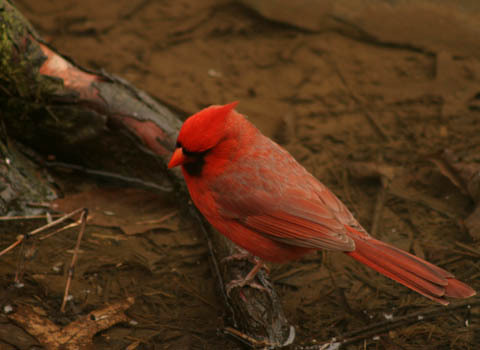 Some of the most active visitors are the cardinals. The males take turns chasing off other birds and play King of the Feeder Ledge and munch down some seeds before being chased off by another male. The females wait quietly in the nearby shrubs until there is a lull in the mange-a-mania, and then perch politely on the feeder ledge. But no matter one’s feeder manners, seed-crunching is a messy business. 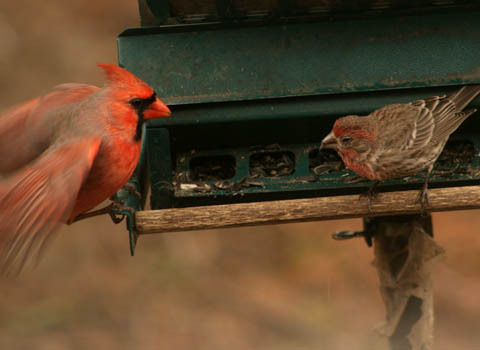 The House Finches were the only birds that stood their ground against the cardinals. Sometimes the middle slat in the blind is right in the way of my lenses but I don’t mind hunching over for an hour or so because the action is so constant. 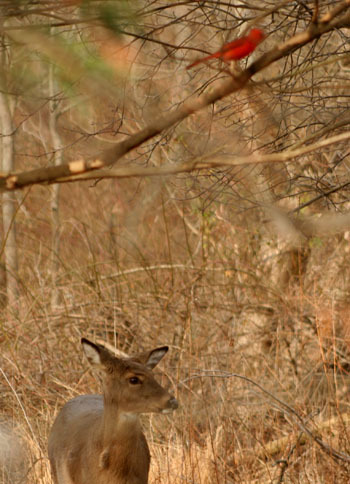 For most of the shots in this post I used my Canon 20D SLR and 300mm lens. The fellow below was digiscoped. You might think that feeder photo sessions would grow boring, but you know what? They don’t. First of all, I can get some nice close ups. Here is a cardinal with a peaceful and benign look to his face, but then, it’s likely he was sated on seeds and was content to let the rest of Bird World enjoy the feeder offerings for a few moments. And there are some fun surreal action shots that I create with slow shutter speeds. The fellow below was making a fast reverse from off the ledge when a house finch made it clear no cardinals need sit and eat. In between forays to the feeder cardinals made enjoyable subjects for idle shots. I could never get tired of that red on the male. Nor could I ignore the subtle hues of red and tan mixed in with the olive green plumage on the female. With her back to my lens this female blends nicely into the background of her environment. Yes, those cardinals were everywhere. 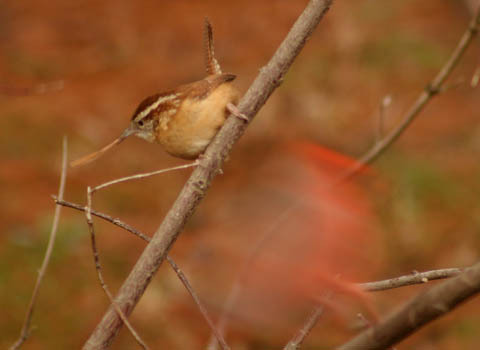 I took a shot of this Carolina Wren and just look who manages to get his picture in there. I love that close-up of the male, he just looks velvety. 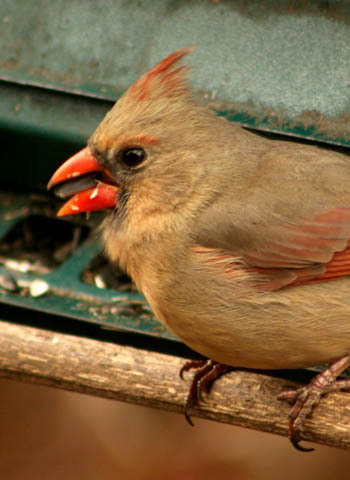 And I have to laugh at your messy business comment - most every time I take a photo of a female Cardinal at the feeder, she’s looking very slobby with food all over her face and beak. Very uncouth! Amy- I also love that male. I’ve made his image my desktop background for now. Although Miss Messy Beak might be a good one too. I love the cardinal shots Beth- especially the close-up! Can you email me a copy so i can try to print it up? Thanks. I like that close up too. His expression is so at-peace-with-the-world. Great pictures! I especially liked the one of the female cardinal from the back showing how her coloring blends in with her surroundings, and the first picture with the deer also. I know what you mean about never getting tired of feeder photos, or the birds that frequently visit. Sometimes it seems like life is so busy and time is so short…but even a quick glance out the window at the feeder somehow makes everything just a little better. Thanks, Diane, I also like the way that female blends in. 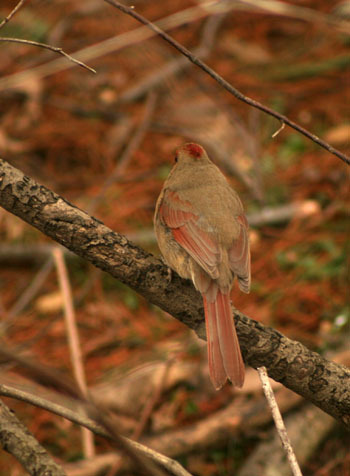 I never tire of looking at the female cardinals colors. And I got lucky with that male cardinal with the deer. I love the overall soft browns and then the splash of red above. Thanks. Amber, you’re right about those feeders. They have never disappointed me for photo opps and there is definitely something reassuring to see nature in its everyday pace. Glad the cardinals were entertaining. 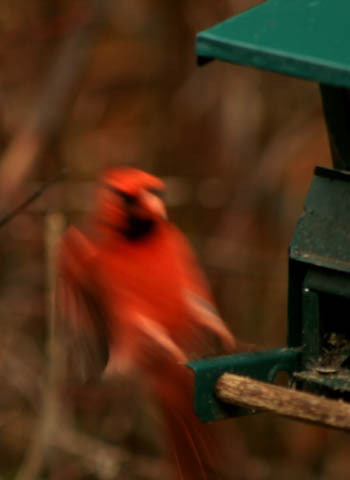 What a nice series of photos on the cardinals. Though common feeder birds in many areas, I don’t get many so I appreciate seeing them any time they chose to visit! And I agree: feeder photography, despite being pooh-poohed by serious “nature photographers” does NOT get boring! 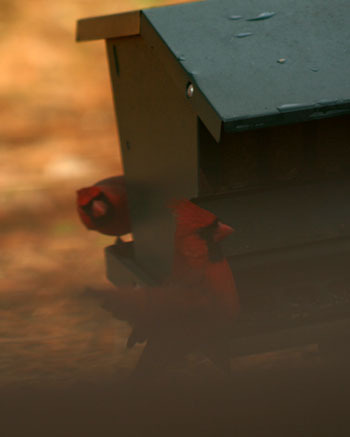 Thanks, Zen Birdfeeder: I plan to get more shots of those cardinals. There are some great mid-air action opportunities and other shots that I haven’t got yet. I think they and their friends can keep me fairly busy at the ol’ feeder. Super captures Beth! I love feeder shots. The birds are usually easier to approach and you can get some great portrait shots you wouldn’t normally see. 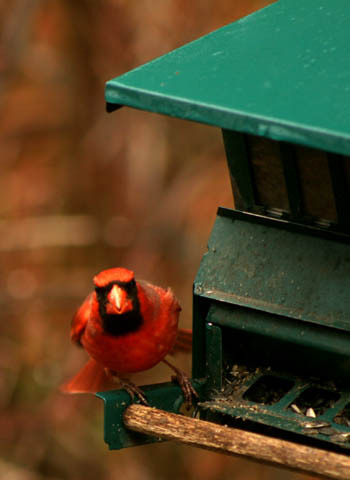 Besides, my bird feeder shots will be different from others for many reasons. Different species, different habitat and lighting, just to name a few. Just as I love seeing birds around the bird feeders in India or Sri Lanka, I’m sure the folks who live there love seeing my California birds. The feeders are fun, aren’t they? The birds are always there (especially in bad weather) yet they are always doing something different. At this same feeder station I also saw a Cooper’s or Sharp-shinned chasing a grackle. Even before I saw the hawk, the sudden panicked disappearance of all the birds and the way that grackle tore across the feeder area, I just knew something bad was coming.